But, we aren’t (even though I could swear it at times!). We are raising children, and they are not little adults. They don’t have the social awareness to know that their behavior isn’t appropriate, and it is up to us to gently guide them so they won’t end up being shunned from social gatherings. However, even though we know what the end goal is, there are considerations when we are talking about the acquisition of manners. 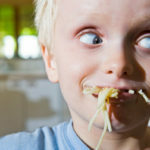 Much of what seems like bad manners may actually be typical development, or may help children with sensory issues learn about their food. Using hands instead of utensils is normal as little ones explore the physical properties of their food and gain skills with utensils. They may switch back and forth for a while, depending on what type of food it is, how hungry they are, and what their experience and comfort is with that particular food. There is also the possibility that your child actually can’t help it. Consider the elementary-aged child who was constantly told to chew with her mouth closed; she finally was able to explain to her mother that she couldn’t breathe with her mouth closed. The ENT discovered that her adenoids were so large that they were occluding her airway, and eating with her mouth open was the only way she could breathe! So what can you do about it? Here are some tips to help transition from the Medieval Times to The Age of Enlightenment! #1) First of all, make mealtimes a place of connection where your children want to be. This means creating a space free from pressure to eat- faster, more, different, or ‘better’ foods. If they come to the table with a pit in their stomach, their behavior is going to reflect that. If mealtimes have been about negotiating bites and they’ve resisted efforts to try to get them to eat, behavior will suffer. This means creating the environment that allows your child (and you!) to come to the table without anxiety (covered in our STEPS+ approach). If you are still working on this, stay here until this step is accomplished. Let go of manners for now and just focus on pleasant meals. #2) Identify the 3-4 manners that you want to focus on, and make those a priority. Tackle one per week to keep their focus. Give your kids an easy-to-understand reason why it isn’t appropriate. It always helps to point out if they would like to have whatever it is done to them or done in their presence (the Golden Rule of manners). “Why can’t I put my feet on her chair?” Well, because she hates it and screams and she can’t eat her dinner if she is screaming. “But I have to burp!” It happens to everyone, but we always say excuse me and never do it on purpose. People don’t want to hear it- it grosses them out! “But I didn’t want this green bean on my plate!” (so I threw it) When you don’t want the food YOU put on your plate, you can ask mommy to move it for you or you can put it on a napkin. People don’t like to have food thrown at them, and you don’t like mopping, do you? #3) Talk about manners OUTSIDE of mealtimes. Discuss with your kids (at a level they can understand) how their manners affect others. Place importance on allowing others to enjoy their meal without having to listen to gross noises or contend with flying food. #4) Comment on good manners while you are at the table, but don’t go overboard with praise. The idea is to highlight that you are noticing their attempts to use good manners but not disrupt the meal. #5) Provide the child who didn’t quite meet the mark with some feedback after the meal. Leave any criticism of manners to after the meal so you aren’t causing stress that may interfere with your child’s eating. I like the feedback ‘sandwich’: you tell the child something they did well, something to work on, and then another positive comment. That way, the criticism is sandwiched between two positives. Even though manners are important, keeping peace at the table is even more important if you have an extreme picky eater in your midst. While it is our job as parents to teach manners, it may be months or years before you really see your hard work paying off….I’m just hoping my oldest son can go on a date and not put his feet on her chair!